Total organic carbon (TOC) analyzers present a rapid, efficient measure of the carbon contamination content of public drinking water and ultrapure water for lab operations. Thermo Fisher Scientific (Waltham, MA) TOC analyzers are integrated into lab water purification systems, rather than sold as stand-alone instruments. For at-line operation, the analyzer extracts a sample periodically and runs the TOC measurement discretely and apart from the water production line. Several vendors offer similar systems. Thermo Fisher’s is incorporated into its Barnstead NanoPure brand of water purification systems, which also provides resistivity, conductivity, and temperature measurements. Click here to read more about TOC Analyzers. 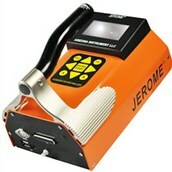 The Jerome® J605 Hydrogen Sulfide Analyzer is a portable H2S detection instrument that uses gold film sensor technology and can read as low as 3ppb with a resolution of 20ppt. The J605 is housed in a light and ergonomically designed case, setting a new precedence for low-level, portable monitors. The industry-proven sensor has been upgraded and improved from previous models, resulting in longer life expectancies. My Lab has an Espec ESL-3CA temp/humidity chamber, and I was wondering if there is a way to increase the temp ramp rate. Specifically from hot to cold. Since this unit does not use Nitrogen it does not get cold very fast. Any suggestions would be appreciated. Advise this member. Keypad is not functioning after normal power up and display reads "select cycle". Checked ribbon cable of keypad and 5 Vdc to logic board and both are fine. Advise this member. Our Partec Cube6 intermittently turns on (not on every try); it then attempts to power up but, within a few seconds, turns off. Any ideas/suggestions? Is there an automatic power shut-off - perhaps temperature-based - in this unit? Advise this member. The HPC-150 flow cytometer from handyem is portable and rugged. Its reliable fiber-optics flow cell eliminates the need for periodic laser alignment and reduces by an order of magnitude the amount of sheath fluid normally required by conventional flow cytometers. Read more. Union Process, Inc., known globally as a manufacturer of particle size reduction and dispersion equipment as well as related services for a broad range of research and industrial applications, has manufactured an SD30 dry grinding Attritor for a customer who is using the mill for reactive milling. Read more. NEW Progenesis QI v2.0 is the next generation of liquid chromatography-mass spectrometry (LC-MS) software for small molecule 'omics data analysis. It takes LC-MS data analysis to new levels of speed and sophistication, enabling users to rapidly quantify and identify the significantly changing small molecule and lipid compounds in samples. Read more. Thank you EZkem for sponsoring the Flow Injection Analyzers category on LabWrench. EZkem is one of the most complete parts, service and support companies currently serving the flow analysis laboratory operations industry worldwide. We specialize in repair, onsite service, technical support, training and installation for a wide variety of analytical flow instruments. They have over 20 years of experience with Alpkem and OI Analytical systems as well as many other lab analysis instruments and we source supplies from all over the globe to assure our customers the best products at the best prices. Contact us for expert advice, timely parts and service and excellent technical support. They're there to help. Visit the EZkem website to view their full line of products. My Saturn 2200 has a CP-3800. The ECD detector was taken out. I would like to use only one of the three injector ports. How do I shut the other two down. The system will not go to ready state unless this is done, or I put columns in the other two ports. Advise this member. When I run the GC, i get this error code: Module 3800.44.3800 has disconnected from system control. Also, the sampler stalls sometimes and I also don't get any data. Advise this member. When I turn on my spectrophotometer everything works until I get a signal indicating my onboard computer has failed. Is there some way to restart the computer system built into the spec or to reload software? Advise this member.